At the point where the River Danube enters the Wachau Valley, the picturesque little town of Melk is best known for its massive Benedictine Abbey, one of the most splendid monastic houses in Austria. 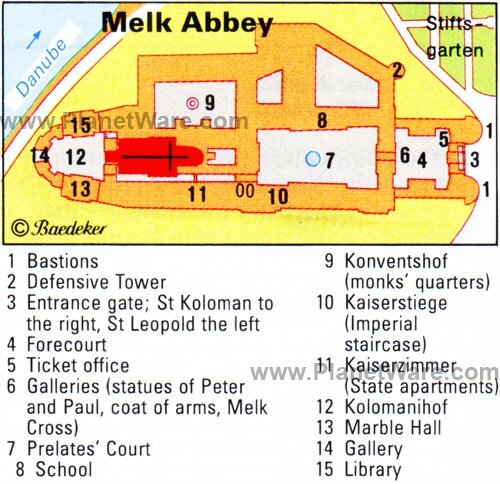 Originally a Roman fortified post called Namare, Melk was later occupied by a castle built to defend the border. In 1089, the castle was handed to the Benedictines and in 1113, the bones of St. Koloman were moved there, ensuring its fame as a place of pilgrimage. By the 13th century, Melk had become an important market town, and after the original abbey had been damaged several times by fire, the present magnificent Baroque structure was built between 1702 and 1738. Melk remains a delightful place to explore, particularly its old town center, which has preserved many of its original historic buildings. The countryside surrounding Melk also has several attractions for tourists. The Donauradweg cycling path is one of the loveliest bicycle routes in all Europe, connecting riverside towns and scenic natural areas. Several castles are within a few kilometers, including the 900-year-old Renaissance Schloss Schallaburg, Schloss Schönbühel, and Aggstein Castle, in romantic ruins. Standing grandly above the Danube and looking more like an imperial palace than a monastery, the buildings of Melk Abbey are laid out around seven courtyards. The most prominent part of the complex, which has a total length of 325 meters, is the west end, with its twin-towered church rising above a semicircular terrace. The abbey's octagonal domed entrance gate, flanked by the statues of St. Koloman and St. Leopold, leads into the forecourt (Torwartlhof), with superb views of its magnificent east façade. Interior highlights include the Imperial Staircase (Kaiserstiege), the banisters of which are decorated with cherubs and stone statues; the Imperial Rooms (Kaiserzimmer), now home to the abbey's museum; and the 196-meter-long Imperial Corridor (Kaisergang), with its portraits of Austria's rulers. Other highlights are the exquisite Marble Hall (Marmorsaal), with its fine ceiling paintings showing mythological scenes extolling the virtues of the ruling house of Austria, and the library, with beautiful ceiling paintings and more than 90,000 volumes and rare manuscripts. The Abbey Church is considered the finest Baroque church north of the Alps and is famous for its twin towers surmounted by helm roofs, along with its outstanding interior with superb 18th-century ceiling paintings; ornate choir stalls and confessional chair; and the artistically carved pulpit and high altar with figures of the patron saints of the church, St. Peter and St. Paul. (English language guided tours are available.) Also of note are the abbey's superb gardens with its Baroque Garden Pavilion (separate admission required), and a regular program of organ recitals. Take some time to stroll through the narrow streets of Old Town Melk, below the Benedictine Abbey. The Town Hall Square (Rathausplatz), the Hauptstrasse, and the Main Square (Hauptplatz) form the village center, together with Kremser Strasse and Wiener Strasse. In Rathausplatz stands the old House for Itinerants (Lebzelterhaus) from 1657 with its fine painted windows, and the Rathaus bearing the town's coat of arms. In Sterngasse is the old abbey tavern dating from 1736 with its stone statue of the Coronation of Our Lady, while parts of the old town wall and the Nibelungen Memorial Tablet (Nibelungen-Gedenktafel) can be visited in Kremser Strasse. Be sure to venture down to the banks of the Danube, home to the old shipping master's house and great views of the river. Finally, south of Linzer Strasse stands the old post office built in 1792 and now a local museum. Just five kilometers south of Melk stands 900-year-old Schloss Schallaburg, considered the most important piece of Renaissance architecture in Lower Austria due to its magnificent two story arcaded courtyard and rich terracotta decoration. A mix of Romanesque palace and Gothic chapel, the schloss features elegant cantilevered staircases and numerous terracotta decorations depicting characters from mythology - most notably the legendary Hundefräulein, a woman with the head of a dog - along with ancient gods and animals. English language guided tours, including exclusive evening tours, are available upon request. Afterwards, be sure to explore the flowerbeds and orchards of the superb castle gardens. Just 12 kilometers northeast of Melk and also on the Danube is the small town of Aggsbach-Dorf, famous as the home of the Servite monastery of Maria Langegg. Perched 550 meters above the Danube, this stunning structure was rebuilt in Baroque style in 1773, with some interesting old frescoes and a fine library added. A highlight of this popular tourist attraction is the pilgrimage church with its imposing north tower façade and rich interior with many wall paintings, a Baroque pulpit, and a fully-restored 18th-century organ. Also worth visiting is the Pilgrimage Museum (Wallfahrtsmuseum) with its history of Maria Langegg and artifacts from the monastery's library and treasury. After exploring the abbey church and the village, cross the Danube to Aggsbach Markt, a popular holiday resort with a notable Late Romanesque 13th-century parish church. Visitors with a feel for history will be fascinated to tour the hereditary castle of Archduke Franz Ferdinand of Austria, heir to the Hapsburg throne, whose assassination precipitated World War I. He and his wife are interred in the crypt here, and the castle is filled with historical objects relating to the archduke and the Hapsburg family. Although signage is not in English, the audio guide follows the visitors' route with information about the exhibits in each room. The gardens and park are known for the outstanding display of peonies, with more than 1,000 plants blooming in May and June. About 16 kilometers north along the Danube from Melk are the spectacular ruins of Aggstein Castle (Burgruine Aggstein), standing more than 300 meters above the river on a steep-sided crag with magnificent views of the Wachau Valley. The castle, founded in 1231 and several times destroyed (and rebuilt), is of imposing bulk, with surviving sections that include parts of its towers, kitchen, and dining hall, along with the chapel and its mighty walls. The site is infamous as the place where the "robber barons" known as the Kuenringer lived, using the site as a base from which to attack and plunder ships and wagons as they passed through the valley below. Opposite the ruins of Burg Aggstein, on the left bank of the Danube, is the village of Willendorf, where the famous Venus of Willendorf, a Paleolithic image of a female figure, was found in 1909. High above the Danube and offering fine views of the Danube Valley stands the handsome Early Baroque pilgrimage church of Maria Taferl. Said to have been built on the site of an oak tree with a revered image of the Virgin, the old twin-towered church - built between 1661 and 1711 - has long been a place of pilgrimage. Notable features of the Pilgrimage Church are its marble doorway, its Baroque ceiling paintings, and other frescos depicting scenes from the life of St. Joseph and the legend of the Virgin. The decorated pulpit with its multitude of figures, and the organ with its rich gold decoration, both from the 18th century, are notable highlights, as is the high altar with its revered figure of the Madonna, and a pietà surrounded by a garland decorated with cherubs. 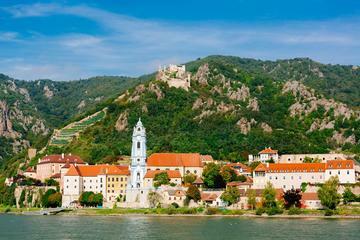 The Wachau Valley is the name given to the 30-kilometer stretch of the Danube between the towns of Melk and Krems, where the river cuts a narrow, rocky valley between the foothills of the Bohemian Forest and the Dunkelsteiner Wald. Undoubtedly the most beautiful part of the Danube, the area is noted for its many ancient little towns (including picturesque Dürnstein) nestling below historic old castles and castle ruins. At the time of the Renaissance, some 31 monasteries were known to have operated here, and as early as 1784, the valley was already becoming popular with travelers, drawn by the stunning scenery and the many inns, known as Buschenschenken, set up by Emperor Joseph II. A particularly pretty town is Maria Laach, famous for its richly decorated Pilgrimage Church with an image of the Virgin with Six Fingers from 1440. Also of interest are the Late Gothic winged-altar from 1490, and the tomb of Freiherr Georg von Kuefstein who died in 1603. Just five kilometers below Melk on the right bank of the Danube, Schloss Schönbühel stands on a crag rearing high above the river. Built in the 12th century on the site of a former Roman fort, the castle has been remodeled several times and dates in its present form - incorporating the old walls - from the early 19th century. Highlights include a relief of The Last Supper on the external wall, while nearby stands the Rosalien Chapel and a convent built in 1674. At the foot of the Schloss lies the market town of Schönbühel, well worth exploring given its position overlooking the Danube. 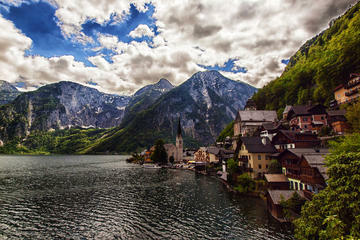 About 18 kilometers north of Melk is the enchanting town of Spitz on the left bank of the Danube. This old market village, occupied since the time of the Celts and first mentioned in AD 830, has been fortunate in retaining many of its beautiful Renaissance and Baroque houses, a fact that adds to the charm of its quaint streets. It's also famous for the vine-clad hill rising above it, known as the Tausendeimerberg, and the Late Gothic church of St. Maurice, with its fine group of Apostles from 1380 and an altarpiece by Kremser Schmidt on the high altar. Other highlights to explore are the nearby ruins of Hinterhaus Castle, and the Teufelsmauer - the Devil's Wall - a curious spur of rock that projects into the river on the left bank. South of the picturesque town of Krems and 40 kilometers northeast of Melk is the magnificent Göttweig Abbey. Perched prominently on a wooded hill, 269 meters above the Danube, this former Benedictine abbey - now a UNESCO World Heritage Site - was founded in 1704 by Bishop Altmann of Passau. The present buildings were begun in 1719, and work continued until 1783, leaving the plan unfinished. The parts completed were the east and north fronts with the Kaiserstiege, one of the finest staircases of the Baroque period, and its superb ceiling painting from 1739 depicting the transfiguration of Emperor Charles VI. The Abbey church also impresses, particularly its imposing Baroque façade with twin towers and a spectacular entrance. Interior highlights include the Baroque decorations and furnishings, stained glass, and the choir stalls with their intricate inlaid work. 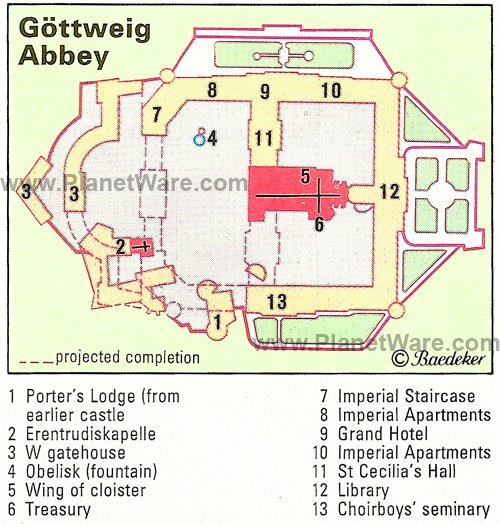 Other highlights include the convent buildings north of the abbey church, in particular the Altmann Room with its superb Grand Hall; ceiling frescoes and paintings; and the four Imperial Apartments, including the Napoleon Room and the Cecilia Room with paintings by Andreas Altomonte and Kremser Schmidt. Luxury Hotels: Opposite the entrance to the abbey and within walking distance of the boat landing, Hotel Restaurant zur Post is a popular meeting place for locals. On the opposite side of Melk from the river and easy to reach from the highway, Hotel Wachau has spacious rooms with balconies, a good restaurant, reliable Wi-Fi, and includes breakfast. Mid-Range Hotels: Right on the Hauptplatz, Hotel Stadt Melk is a good choice for those arriving by train, a 10-minute walk from the station. Some rooms have views of the abbey. On a charming, small square that's also an easy walk from the station and close to the abbey, Cafe Restaurant zum Fursten has small no-frills rooms with free Wi-Fi and free parking. Also with a restaurant and below the abbey in the old town, Wachauerhof offers plain rooms, some with balconies, and on-site parking. Budget Hotels: Handy to the Donauradweg cycling path, Pension Marillenhof is a 10-minute walk from the town center and the abbey. Pension Weisses Lamm, above the river and just off Hauptplatz, includes free parking and breakfast. In Pöverding, a few miles outside of Melk in the rolling countryside, Lugerhof is small and beautifully kept, serving an excellent breakfast of fresh local ingredients.